I have been working lots this week including teaching on Saturday so have not had as much time for crafting as I hoped and only made one of the three knitting sessions that I had planned. However it has been a very nice week – I have been out and about observing my students teaching which has been very interesting. I consider myself very lucky to have a lovely job that I enjoy and hopefully it will continue – massive cuts in government funding ahead so who knows! 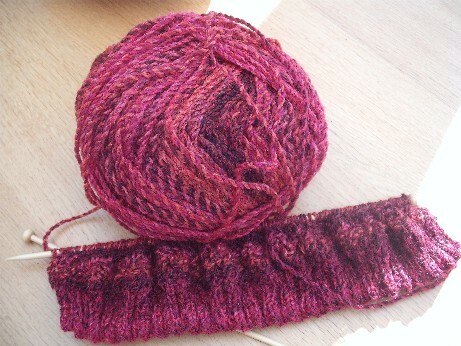 I have made pretty good progress with the hat – I am making this out of the same James Brett marble chunky that I used for my wristwarmers knitted over Xmas. I thought maybe I wouldn’t get the wear out of it being so late in the year for hats but it has been very much blowing a gale this week so I have been very cold when out and about so will be glad of it. Some parts of the UK have had snow but luckily not us – yet! Though snow at Easter is not unheard of in Yorkshire. The pattern is another freebie from Ravelry called Springtime Sloppy Beret and has a lacy pattern on the main body of the hat. I might try the same pattern for a scarf and put some fringes on each end as well. I have also finished another one of the JBW Xmas Stocking ornies for my tree – this has yet to be made up but I am doing ok so far with my one a month – though this is actually Feb’s ornament as it was started then so will have to get cracking on March’s one. 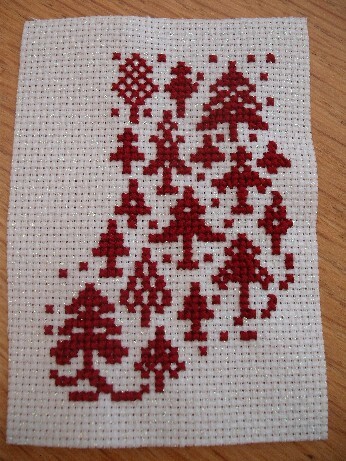 Thinking of doing the Xmas pudding one next. Have also just signed up again for the Seasonal Exchange Blog Spring exchange (missed the Winter one due to slackness on my part of checking blog) so will have to have a think about what to do for that. Look at all the pretty little trees! I would like to share with you a blog I have just recently found – this is not a crafting blog but a gardening one and belongs to Dave who is the brother of one of my old friends Pete. Pete posted the link on Facebook and I read all of his old posts last night and loved it. He has a brilliant and very funny writing style and the photography is amazing. He is a professional gardener who mainly works at a Tudor Priory in Sussex. The blog is called The Anxious Gardener so do go and have a read. Well here’s hoping we all have a nice week ahead, I have a very nice weekend planned at the end of it – a sewing day on Saturday with the quilt group (might finally get the bunny quilt cut out!) and a sewing day with the girls from the medieval group on Sunday. Am trying to give up housework for Lent so have to find distractions to stop me being tempted! Thank you very much as always for visiting.